NexLogic Technologies, Inc. announced during Semicon West 2018, July 10 - 12 that it is entering into the growing PCB field of microelectronics with the completion of its Class 10,000 and Class 1,000 under the hood cleanroom. The company has the full complement of leading edge technologies, microelectronics manufacturing systems and personnel to meet customer requirements. 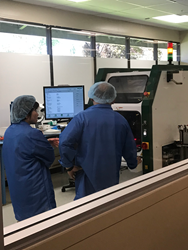 NexLogic Technologies, Inc. announced during Semicon West 2018, July 10-12 that it is entering into the growing PCB field of microelectronics with the completion of its Class 10,000 and Class 1,000 under the hood cleanroom. The company has the full complement of leading edge technologies, microelectronics manufacturing systems and personnel to meet customer requirements. NexLogic has made CAPEX investments including a new Class 10,000 cleanroom, and have hired fully trained personnel to comply with this growing industry demand. A HESSE Bondjet BJ820 fully automatic fine wire bonder is at the forefront of NexLogic’ s microelectronics manufacturing systems. It is capable of ball, wedge, and wire bonding using aluminum, copper, or gold wires. A Janome JR3303 Robotic level flux and epoxy dispenser, TPT-HB16 Wire/Ball Bonder, Royce 620 Multi-test Bond Tester and sheer strength puller, and Keyence VK-X1000 Profile Measurement Microscope for wire bond inspection and verification system complement the HESSE fine wire bonder. In particular, the Keyence inspection system inspects and verifies wire bonds and bends to micron level accuracy. An ISO 9001:2008, ISO 13485 Certified, and RoHS compliant EMS provider, NexLogic is a leading electronic manufacturing services provider that offers total integrated circuit board solutions. The company was established in 1995 and serves over 200 customers in North America. NexLogic’ s mission is to be the best electronic manufacturing services (EMS) provider to the markets it serves through high quality and an efficient manufacturing process.